Located between the George Washington Parkway and the town of Vienna, the area is known for its many upscale homes, as well as for its high-end shopping, such as at the nearby Tysons Corner Center and Tysons Galleria.McLean is also home to many diplomats, members of Congress, and high-ranking government officials partially due to its proximity to Washington, D.C. Amenities & Landmarks: The McLean Community Center offers a continuing program of activities for adults and children, including a wide range of classes, lectures, study tours, camps, art exhibits, theatre performances, and specialty shows. The Center also sponsors major community activities such as McLean Day at Lewinsville Park in May and the 4th of July Fireworks at Langley High School. The community center facilities include the 386-seat Alden Theatre, the McLean Project for the Arts galleries, the Susan B. DuVal Art Studio, meeting and conference rooms, a rehearsal studio and a classroom/commercial kitchen. The Center also operates the award-winning Old Firehouse Teen Center, the first of its kind in Fairfax County, and proof of McLean’s continuing commitment to its youth, their safety and future. Economy: McLean is the most expensive ZIP code in the Washington Metropolitan area and ranks among the most expensive in the United States.Mclean is located in close proximity to Tysons Corner, the 12th largest business district, and employment center in the United States; and, the largest shopping mall in Virginia, and Baltimore-Washington Area. Tysons Corner Center is Virginia’s largest office market and one of the leading business centers in the nation with nearly 26.6 million square feet of office space. Local area employers include the Central Intelligence Agency; and, Fortune 500 companies including Capital One Financial, Gannett, Hilton and Freddie Mac. Education: Mclean High School is ranked 4th within Virginia. Getting Around: The Capital Beltway, George Washington Memorial Parkway, Interstate 66, Dulles Access Road, Dolley Madison Boulevard/Chain Bridge Road, Georgetown Pike, and Old Dominion Drive all run through McLean. McLean Station on the Washington Metro Silver Line is scheduled to open in 2014, two miles west of the village near Tysons Corner. 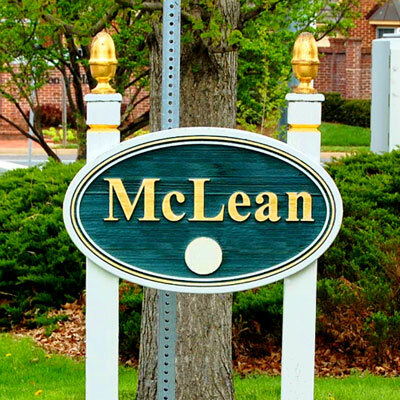 History: Founded in 1910, McLean is named after John Roll McLean, the former publisher and owner of The Washington Post, who, with other investors, built the 1906 electrified Great Falls and Old Dominion Railway that connected the area with Washington, DC. Although service ended in 1934, the McLean Station at Old Dominion Drive/Chain Bridge Road became the focus for development that evolved into the community of McLean, VA.